SS Billiards was born November of 1970 when a local strip mall was completed. A man by the name of Sam Snelling owned and operated it with six pool tables, a cigarette machine and pay phone. Another operator had five pinball machines and a fooseball table in there. 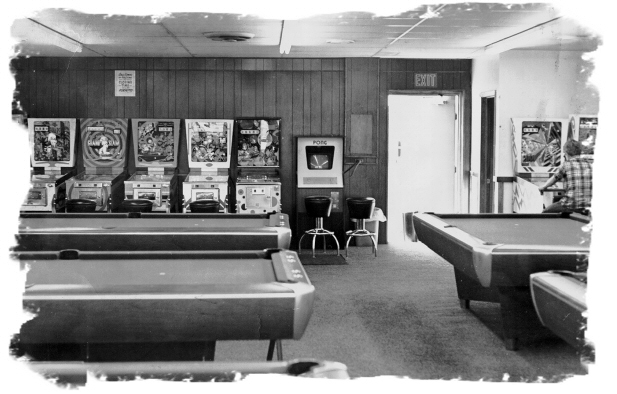 The average life of a game room is a year and a half and Sam was going to sell it or close it before the end of his two year lease in November of 1972. He was preparing to close it and had started selling off the equipment, he sold one pool table. With the dreams of owning her own business, my mother Mabel DeMar bought it from Sam with my help in September of 1972. The Hopkins City council approved the license transfer at a city council meeting the night of September 19, 1972. We took control of the business the next day and on September 20th, 1972 we opened at 3:00pm. Our first customer was Mike McNeil about 4:00pm, he got two dollars worth of quarters and we were off and running. The first winter air hockey became big and we had one of those in there for a year and a half. By mid 1974 fooseball was getting big and we went from one table to two, then four, and finally six tables. As that fad was over we went back to four then to two and finally to one table which left in mid July 1976. Meanwhile early video games had been growing from Pong in early 1973 to even better games by 1975, and by 1979 the video fad was on. My Mother sold me her interests in the business in February 1979 and helped out until October of 1987 when she retired. Late in 1979 I got rid of the operator and bought my own games. In 1983 the video fad bubble burst. Things were lack luster until the mid 1980's when the industry started picking up again. Video games were gaining again and pinball was coming on strong. By 1990 pinball was probably at it's zenith. By the mid 1990's the industry was on a down turn again and by 2000 I was trying to have a niche market by being predominately pinball oriented. Friday March 2nd 2001 was the first of many great pinball events starting with the "Launch Those Geese" pinball party. Which continues to this day growing and evolving into many more pinball events and one of the best places in the country to come visit and play pinball and meet LTG :) in person.